The rare combination of Mark Walker and Benny Woodworth teamed up on Sunday to both claim arguably their most important win in Singapore to-date – their first Singapore Gold Cup, thanks to Elite Invincible. Long earmarked as Gold Cup material, especially after winning the first two Legs of the Singapore Four-Year-Old Challenge, the Group 2 Stewards’ Cup (1400m) and the Group 1 Giovanni Racing Charity Bowl (1600m), the Irish-bred four-year-old by Archarcharch overcame an interrupted prep (due to a fever) towards the $1.35 million Group 1 Dester Singapore Gold Cup (2000m) with a bold and unexpected on-pace run that saw him stave off a gallant Circuit Land (Ruan Maia) by a head and send trainer and jockey into raptures. Twice crowned champion trainer in Singapore and five times in his native New Zealand, Walker had yet to lay hands on the Holy Grail since his relocation in 2010. Elite Invincible makes a beeline for the winning post in the Dester Singapore Gold Cup. 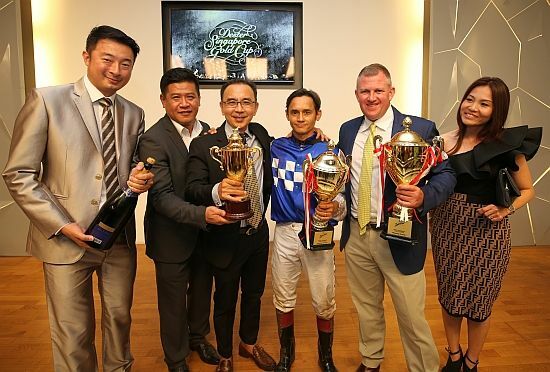 While he had most of the feature races back home ticked off on his glittering resume, Group 1 wins at Kranji had in contrast not been quite a staple, until Elite Invincible recently broke the duck in the Giovanni Racing Charity Bowl (1600m) in June. For good measure, Elite Invincible has incidentally brought up Walker’s 500th Kranji winner in the country’s richest and most prestigious domestic race, a race which had eluded him since the very first good horse he took along to Singapore from Matamata, Tell A Tale, ran second to Risky Business in 2010.